Growth does appear to be slowing down. The titan has grown one half inch (2.3 cm) since yesterday. The maroon coloration of the spathe continues and is becoming more apparent towards the top of the spathe. There is much movement with the spathe which leads us to think its getting close. My original prediction of Labor Day may have been a bit lofty and I think I want to take this opportunity to retract my prediction. This thing could open tonight, although it will most likely be tomorrow or Friday. The opening is an exciting event. Last year, our titan arum flower took just about 4 hours to open. From what Ive read, many titan flowers open at night. I wouldnt be at all surprised to find an open titan arum inflorescence awaiting us tomorrow when we get in. 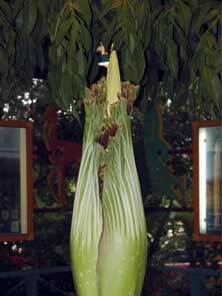 Some titan blooms will begin to bulge around the center of the spathe a day or so before opening. Last years bloom we did not notice this and I wonder if the bulging is more typical of the larger blooms. 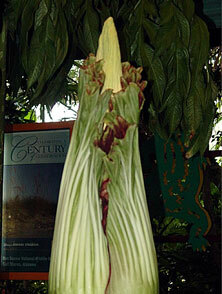 This current titan bloom, while closing in on 4 feet (122 cm), is still a small inflorescence by titan standards. So perhaps it will open without a noticeable bulge in the spathe. Well know more tomorrow. This page was created by Scott Hyndman for the I.A.S. on September 1, 2005.